The AmD with AutoAid/RCIB Insurance Racing team will hope to impress this weekend when the Dunlop MSA British Touring Car Championship heads for Knockhill for the eighth round of the season. Although the trip to Scotland is the longest on the calendar for the West Thurrock-based team, the Knockhill meeting will be something of a home event for the MG squad thanks to its all-Scottish driver pairing of Rory Butcher and Glynn Geddie – who go into the meeting hoping for a strong showing in front of a partisan Scottish crowd. Fife racer Rory, the son of circuit owner Derek Butcher, will be competing on home soil in the BTCC for the second time having made his debut in the series in the corresponding meeting last year. 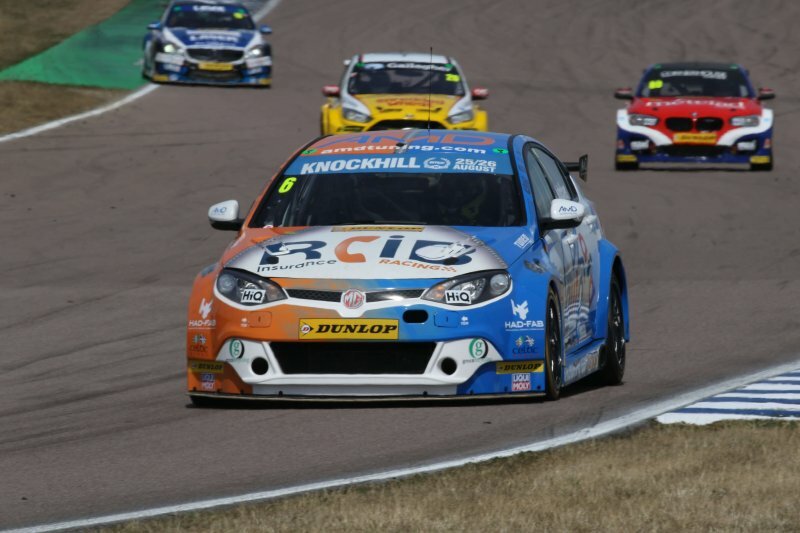 Having picked up a brace of top ten finishes on his first weekend in a touring car, Rory has gone on to establish himself as a regular contender for points and arrives at Knockhill on the back of his strongest weekend to date last time out at Rockingham. Three top ten finishes included Rory matching his career best result of sixth, with the 31-year-old eager to try and maintain that form in what is sure to be his biggest meeting of the year. Aberdeen team-mate Glynn enjoyed a solid debut in the MG6 GT at Rockingham having gone into his first weekend with the team without any prior testing in the car. Showing gradual improvement across the weekend in terms of his pace on what was his first outing in front-wheel drive for some four year, Glynn will now hope to push on towards the points scoring positions at the circuit where he secured his best ever BTCC qualifying result on his last visit back in 2014. Unlike his first meeting with the team, Glynn will go into the weekend without any additional ballast on his car and – like Rory – eager to make the most of the support of his home fans. “I really can’t wait for the weekend to come around; I’m absolutely buzzing about it. Twelve months ago, my BTCC debut at Knockhill was very last minute and I was almost going in blind, but now I have twelve months of experience in the series under my belt and am in much better shape as a result. “As the home driver, there will be a lot of expectation from people and it’s important that we don’t get carried away, but at the same time, I go into the weekend hoping to push for some really strong results on track. “I’m going into the Knockhill meeting feeling as confident as I can be. We saw how close things were at Rockingham and I think it will be the same again this weekend so track position is really going to be key. “If we can get a break in qualifying and put ourselves in a good position on the grid then I feel confident that I can then try and push forwards, as my race pace on my debut in the MG was good. The time I’ve now spent in the car can only help me as I have more knowledge and more of an idea of how it is going to react to changes, and also experience of the tyres. “This is without doubt the biggest weekend of the season for the MGs and we go to Knockhill hoping to challenge for some good results. Both Rory and Glynn will be able to count on huge support from the watching fans and hopefully we’ll be able to give them plenty of reason to cheer. “For obvious reasons, Rory knows the circuit better than anyone else on the grid and we are confident that he will be able to use that knowledge to his advantage to build on the results he picked up at Rockingham. Massive thanks again to Marc Waller for the photography!